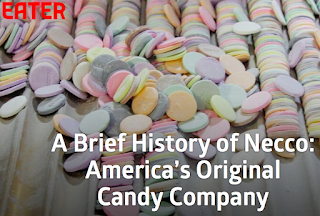 Eater ran this great piece on Necco or New England Confectionery Compnay. Check out the great interior factory photos. Here's an excerpt or click on the photo and read the whole article. The Necco Wafer, the company's first product, and its longest lasting, most famous, most widely available, is also still its best-selling. Necco produces about four billion wafers each year. Holding a package of Necco Wafers today, it's not hard to imagine how the candy was used as a delivery vehicle for medicine. The paper wrapping, nearly as unchanged as the candy itself in 153 years, is thin and labeled with a three-color ink Necco logo. Unwrap the cylindrical package and a dusty deck of colorful discs emerge, each stamped with the Necco name. The wafers are sweet, but not cloyingly so. They taste a lot like hardened fondant, a dry mixture of powdered sugar, cornstarch, glucose, and water. If you've never had a Necco Wafer, they're hard to love on first taste. But much of America has fond memories of them; the chocolate flavor is especially popular.